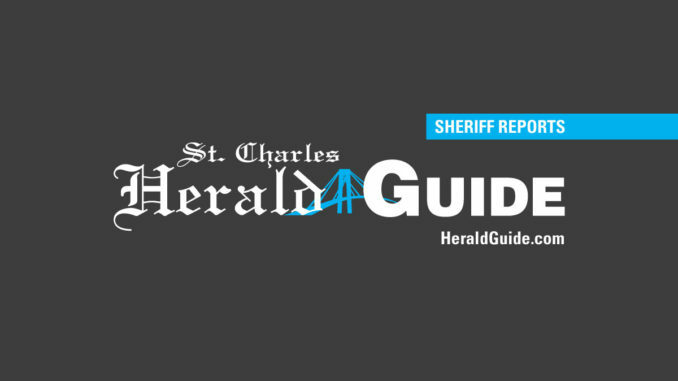 • John L. Smith III, 60, of Luling, LA, was arrested and charged with indecent behavior with a juvenile at St. Charles Correctional Center on March 12. Sheriff Greg Champagne reports that the above subject was arrested on a warrant that was issued on March 12, 2006 for the above charge. On March 11, 2006 the subject was observed taking inappropriate pictures of a six year old juvenile, and allegedly inappropriately touching a juvenile. Smith was released on March 14, 2006 after posting $12,530. • Marshall D. Charles, 42, 759 E. Terrace Street, New Sarpy, LA, was arrested and charged with battery of a school/recreation athletic official at 1Wildcat Lane, Destrehan, LA, on March 11. Sheriff Greg Champagne reports that the above subject was arrested following an altercation with a 37 year old Norco man. The victim, who was a referee at a basketball game, was approached by the subject and punched the referee in the face. • Oscar R. Carmona, 25, of 4500 Palmayra Street, New Orleans, LA, was arrested and charged with DWI, reckless operation, operating a vehicle without lawful presence in the US and rolling a road block on March 13. • William Russell, 55, unknown address, was arrested and charged with DWI, reckless operation, suspended DL and open container on March 13. • Alejandro Bocangier, 26, of 203 Riverview Drive, Destrehan, LA, was arrested and charged with DWI, reckless operation and driver not license at US 61 @ Riverbend, St, Rose, LA, on March 16. • Coleman V. Ruiz, 56, of 111 Carr Drive, Slidell, LA, was arrested and charged with DWI and reckless operation at Hwy. 90 Westbound @ Second Street, Boutte, LA, on March 18. • Jane D. Heausler, 45, of 616 Mary Lane, River Ridge, LA, was arrested and charged with DWI, reckless operation, Poss. of SCH II (hydrocodone), poss. of SCH IV (valium) and prohibited acts at Ormond Blvd., Destrehan, LA, on March 18. • Blake M. Landeche, 34, of 604 Sugarhouse Rd, Luling, LA, was arrested and charged with DWI, hit and run, expired plates and no vehicle registration at Rex and Davis Drive, Luling, LA, on March 18. • Emile R. Manzella, 22, of 2905 Pelican Drive, Chalmette, LA, was arrested and charged with DWI and reckless operation at US 90 @ LA 635, Des Allemands, LA, on March 19. • Two 12 volt deep cycle batteries, total value $160, were reported stolen from 16179 LA 18, Taft, LA, on March 13. • A camera, video camera, assorted candles, assorted clothing, assorted jewelry, a playstation 2, an undetermined value, were reported stolen from 204 W. Hoover Street, New Sarpy, LA, on March 13. • A 2004 Cheverlet Avalanche, valued at $30,000, was reported stolen from 601 Ormond Blvd., Destrehan, LA, on March 14. • Assorted lumber, valued at $2000, was reported stolen from 430 Willowdale Blvd, Luling, LA, on March 16. • A passenger side chromed rocker panel for a vehicle, valued at $250, was reported stolen from 818 Fonda Street, Paradis, LA, on March 16. • Five Omni Guard differential pressure recorders, valued at $4500, was reported stolen from 101 Delta Drive, St. Rose, LA, on March 16. • Two lawn mowers, valued at $900, was reported stolen from 543 West B Street, Norco, LA, on March 15. • An ice machine, a meat grinder, cast iron pots and pans, rubber boots, and a vending machine, a undetermined value, was reported stolen from 14468 LA 48, New Sarpy, LA, March 15. • A VCR and a boombox, valued $110, was reported stolen from 1538 US 61, Montz, LA, on March 15. • A bicycle, valued at $100, was reported stolen at 2231 Paul Mallard Road, Boutte, LA, on March 16. • A Play Station, 4 digital video disks and an inflatable mattress, valued at $300, was reported stolen from 146 Hollywood Park, Montz, LA, on March 17. • A Mongoose bike, valued at $140, was reported stolen from 323 Meadows Drive, Destrehan, LA, on March 17. • Thirteen 30 yard style containers used for debris removal, an undetermined value, was reported stolen from 10500 U.S. 61, St. Rose, LA, on March 18. • A 19 ft. bass boat, a Mercury outboard motor and a boat trailer, an undetermined value, were reported stolen from 401 River Oaks Drive, Destrehan, LA, on March 19.